Last week one of the worlds quickest men Asafa Powell failed a drug test for the banned stimulant oxilofrine. This is thought to be a component of a sports supplement, maybe a contaminant, but is it performance enhancing and why is it banned? Should it be banned? It seems the World Anti Doping Agency list of prohibited substances in sport grows longer and longer each year. 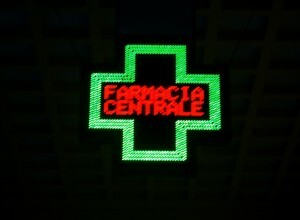 New drugs come into the market each year so perhaps that is understandable. But are they all included for good scientific reasons or are they there because it is felt they should be? I have wondered about this and whether having so many drugs listed is a positive. Many athletes over the years have failed tests due to contaminated supplements (or ahem, contaminated beef). An athlete has a strict liability for any substances found in their urine or blood sample. In the case of a possible contaminated supplement the athlete would have to prove that they did not deliberately take the drug and that the supplements were contaminated. They could then face a reduced ban. This strict liability is a fundamental of doping control and should remain so. Forcing the authorities to prove intent to dope would make it impossible to police. So – do all of the compounds on the list pass these tests? Probably not. 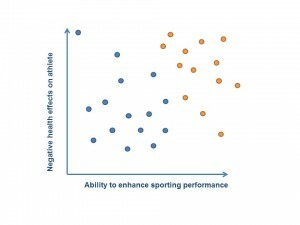 The third item, ‘spirit of sport’, is a very difficult term to pin down so could be used as a bit of a ‘catch all’ when there may not be enough evidence of performance enhancement or negative health effects. Let’s take for instance Asafa Powell’s oxilofrine (methyl synephrine). Is there any evidence to say this actually enhances performance? If not then why is it banned when caffeine, well proven to have performance enhancing effects, is not. In how many sports would cannabis have a performance enhancing effect or pose an actual health risk to the athlete? It is on the banned list for in competition tests and (according to WADA stats accounts for 8 % of positive tests currently). I would propose a simplification to have two overall panels of drugs – one for in competition and one for out of competition (not dissimilar to now). These lists should include only the 60 drugs with the highest potential for enhancing performance, the most likely to have an effect. 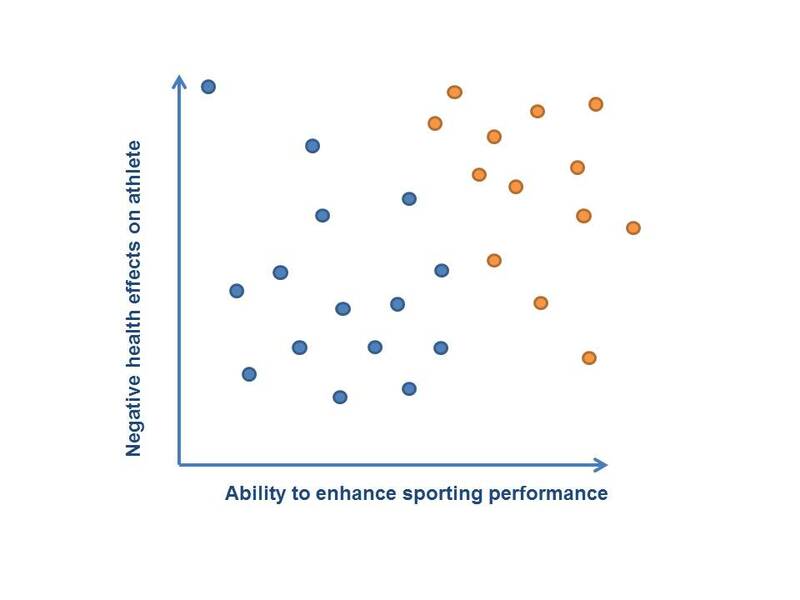 A panel of experts could score each drug based on potential for long term sporting gain and negative impact on users’ health (for the out of competition list) and for ‘game day’ testing you could include immediate enhancement of sporting performance. There would be a large overlap between the two groups. Many drugs, EPO for instance, give long term gain training effects and also on the day enhancement. Cocaine on the other hand may give some ‘on the day’ performance boost but is unlikely to give any positive long term effects. This is not that far from the current system but less sprawling, more focussed. A plot of the results of the surveys could be made such as shown below (with various weightings and component analysis models, this shows a very simple 2D plot for ease of viewing). This idea is very much inspired by Prof David Nutt‘s work published on reclassification of drugs of abuse as published in The Lancet in 2007. From the chart below those dots coloured blue have the lowest weightings and are less likely to be banned, the orange dots have higher weightings and should be included on the banned list. Perhaps there could be a system to allow each sport to have an additional panel of up to say 10 drugs they would like to ban in addition to the major lists – eg cannabis or alcohol for driving sports, or beta blockers for snooker. I believe that the vast majority of positive tests would be covered by a list smaller than this – a few anabolic steroids (59 % of positives), a handful of stimulants (12 % of positives) plus a few diuretics and corticosteroids, EPO and growth hormone and you would cover 90+ % of cases (removing cannabis from the picture, unless you can convince me it would actually enhance Tyson Gay’s performance)? I have an idea of what many of those 60 would be but would be interested to hear proposals. The number 60 was chosen as an arbitrary number by the way and is up for re-negotiation following scoring all the drugs currently on the WADA list. Any thoughts? I would love to hear whether you think the current system works and changes would allow cheats to prosper, or help clarify where athletes stand? On the other hand having world class athletes expected to be responsible for all potential contaminants however obscure they are seems unsustainable and potentially unfair on them. There are no easy answers. Would it be possible to have a licensing system for supplements and would/could this be arranged by WADA? I can’t see it being cheap. I think we are at a point where athletes believe they have to take supplements and pills to perform at their best – this is leading to a grey area of untested supplement products. Also, an athlete mentality is generally to take 2 pills if 1 is normal as 2 must be better right? The haematocrit 50 % being seen as a target is a good example though of what could happen. I am not so sure this isn’t the case now with the biopassport anyway – people have learnt to stay within certain parameters and still dope. The next question is to whether that is effective doping if you are not altering those blood values significantly? The closest to a licensing system is the ‘informed sport’ system – have your supplement batch tested for contaminants. As an athlete you would be a fool not to use this system if you feel supplements are necessary. WADA won’t get involved in that kind of thing I suspect.